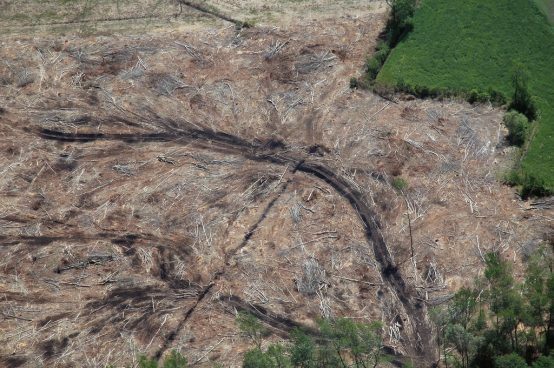 Deforestation in Costa Rica, 2006. Tropical deforestation is a major source of greenhouse gas emissions. Photo Credit: Jane Thomas, IAN. A November letter from 77 civil society organisations (CSOs) worldwide, including Derecho, Ambiente y Recursos Naturales (DAR) from Peru and Buliisa Initiative for Rural Development Organisation (BIRUDO) from Uganda, called on the World Bank Group (WBG) to “fulfil its commitment to prioritise forests and forest peoples’ rights in its support to borrowing countries and the implementation of their nationally determined contributions (NDCs)” to the Paris Climate Agreement. The letter, addressed to World Bank president Jim Kim, coincided with the UN Framework Convention on Climate Change’s (UNFCCC) Conference of Parties 23 (COP 23) in Bonn. It called on the WBG to prioritise forests and indigenous peoples’ rights in World Bank Country Partnership Frameworks. The letter further called on the Bank to strengthen safeguards to protect forests and indigenous peoples’ rights, including for Development Policy Loans (DPLs) (see Observer Spring 2017) – which are not subject to the Bank’s new Environmental and Social Framework (ESF). It also argued that the Bank should take steps to avoid funding direct and indirect causes of deforestation, including through investments via financial intermediaries (see Observer Winter 2017). The link between deforestation and climate change is well-documented: As Frances Seymour of the Center for Global Development noted in an August blog, “If tropical deforestation were a country, it would rank third after China and the United States as a source of emissions.” However, tackling deforestation is a relatively low institutional priority for the Bank, with small lending volumes in comparison to other areas of Bank finance and WBG country teams often lacking specific forest expertise (see Observer Winter 2016). Despite such shortcomings, as the Bank remains the biggest multilateral source of finance for forests, it has a potentially important role to play in initiating meaningful policy change in this area. Events at COP23 itself offered some positive developments in terms of the need to consult with indigenous peoples as part of the broader NDC process. While the 2015 Paris Agreement recognised the contribution of indigenous knowledge in dealing with climate change, COP23 built on this, arguing that countries, “should, when taking action to address climate change, respect, promote and consider their respective obligations on the rights of indigenous peoples and local communities.” CSOs are hopeful the Bank will heed this language in its own forests policy.